Shown in a 2016 file photo, a former tannery in Hancock has been somewhat cleaned up, but the property is far from marketable, town officials say. 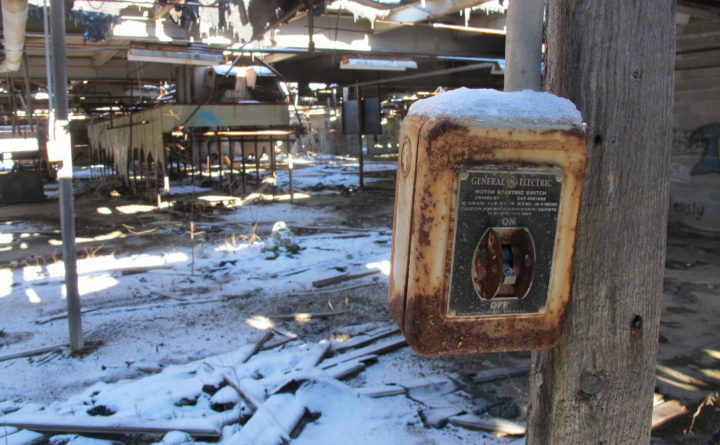 An old switchbox sits mounted on a pole at a defunct tannery off Route 1 in Hancock. 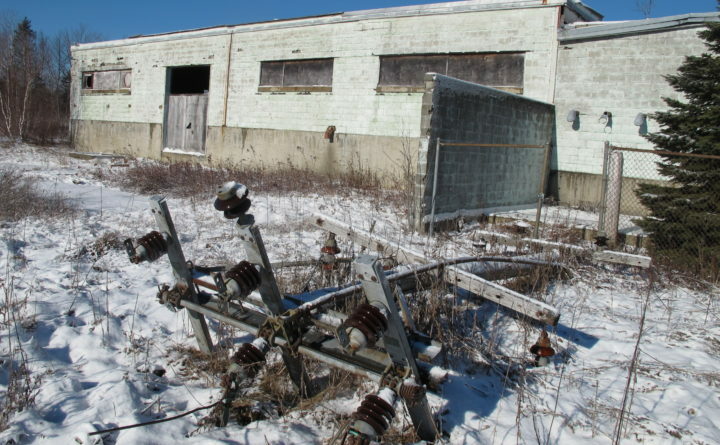 The former Hancock Ellsworth Tannery building off Route 1 in Hancock and an adjacent parcel are polluted with contaminants that have been left on the property for the past several decades, according to Hancock municipal officials. To judge it geographically, the big building at 49 Tannery Road should be the heart of Hancock’s business community. It’s a 71,370-square-foot, single-story structure on 152 acres within sight of Routes 1 and 182. Owned by the 2,400-person town, it drains into Kilkenny Cove and is in a commercial zone — “right in the middle of everything,” said Hancock Administrative Assistant Toni Dyer. The property has problems, though, and by the name of the road it is on, you can guess what they are. It’s the site of a former leather tannery, once one of Hancock’s largest employers, and though it was partially cleaned up thanks to $370,000 in federal grants, the property needs hundreds of thousands of dollars more in cleanup work before the town can market it to potential developers. Late last month the U.S. Environmental Protection Agency finished the first of what is likely to be several cleanups at the tannery, which used chromium and other long-lasting chemical toxins to manufacture leather shoe soles. An EPA contractor rid the interior of the building of cancer-causing asbestos and Polychlorinated Biphenyls, fluorescent light debris, aerosols and other toxins at a cost of about $370,000, Dyer said. Many Maine towns have derelict tanneries. The Penobscot County town of Howland finished cleanup of its tax-acquired tannery on the Penobscot River almost two years ago and is trying to redevelop it. Hancock leaders have similar notions for the property, which came into town ownership in fall 2015 after its last owner, TT Corp. of Bangor, defaulted on $9,605 in property taxes and interest. 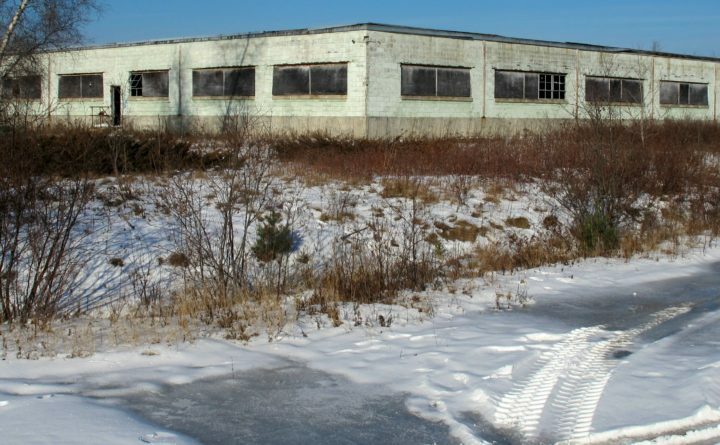 Dyer said that the company had made seven monthly payments of $1,370 on the parcel, which was an active tannery from the late 1950s to the late 1960s, according to the town’s application to the EPA’s Brownfields program for grants to fund the cleanup. Officials have discussed turning the property into a mix of affordable housing and commercial development, Dyer said, but they have a lot of work to do before the property can be marketed. The town’s grant application describes three developable parcels within the property. The largest, 134 acres, has not been affected by industrial waste and could be developed into housing. The smallest, 3.6 acres, includes the building, which has a partially collapsed roof. Another parcel, nearly 14 acres, includes 250 feet facing Route 1. Two more EPA grants of $200,000 each will fund further property cleanups, probably this spring, Dyer said. Town officials and the Hancock County Planning Commission plan to review the cleanup’s progress Thursday.